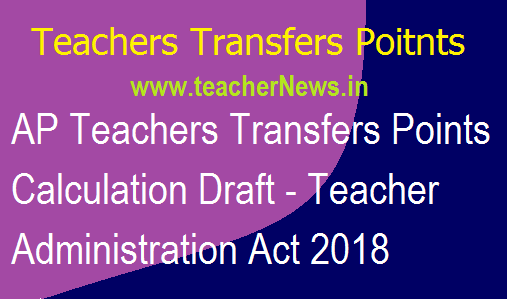 AP Teachers Transfers Points Calculation Draft - Teacher Administration Act 2018 : Teachers Transfers Performance Points and Teacher Administration Act - Teacher Transfers Points. Teachers Transfers Performance Points as per Transfers Act 2018. Transfers Draft of Teachers Transfers Performance Points in Andhra Pradesh as per Transfers Act 2018. Andhra Pradesh Teacher Administration Act. AP Teacher Administration Act - Teacher Transfers Points Parameters. Teachers Individual Performance Points, School Performance Points, Teachers Transfers Bio Metric Attendance Points, Resource Person Points, MDM Points details are given below. How to Measured Parameters for a Teacher in Transfers ? A Bill to bring greater transparency in school teacher(s) administration in the state of Andhra Pradesh to account for appointment, presence, in-class impact, learning outcomes and other benefits through objectively defined, and measured parameters. This bill intends to improve quality of school education in the State with a focus on teacher engagement and provides for matters connected therewith and/or incidental thereto. Whereas there was a need to define objectively measured parameters for administration of school teachers in government schools in the State of Andhra Pradesh in order to improve transparency in teacher administration, adherence to set teaching standards and enhanced performance of students and teachers. The bill envisages development and transformation in Teacher Administration System in the state of Andhra Pradesh. (1) For the purposes of transforming teacher administration, the Government hereby formulates a set of objectively defined, measurable and verifiable and parameters to be administered and applicable for individual teacher employed in a school in the State of Andhra Pradesh, unless otherwise specified by existing Constitutional mandates. Participation and performance of teachers in courses designed for continuous learning and professional development of school teachers and approved by implementing authority. (1) For the purposes of transforming teacher administration, the Government hereby formulates a set of objectively defined, measurable and verifiable parameters to be administered and applicable for institutions such as a school (aided and unaided) in the State of Andhra Pradesh. Student performance in SSC to be calculated as combined effortby the school administration, if and where applicable. (1)The Government, from time to time shall, by notification in the Official Gazette, or by the issuance of a Government Order, frame one or more scheme or schemes to be called the Teacher Incentive Scheme or schemes in relation to incentivization criteria under subsection 2 of section 3 and subsection 2 of section 4. (a).Teacher Performance measured by all parameters or a subset of identified parameters defined in subsection 1, section 3 of Teacher Administration Act. (b).School Performance measured for parameters or a subset of parameters defined in subsection 1, section 4 of Teacher Administration Act. (3)The manner of determination and individual weightage criteria for each of such parameters/grading system shall be in terms of a notification to be made in the Official Gazette, or by way of a Government Order, as issued by the appropriate government from time to time. (4) Every teacher imparting elementary school, or high school education, shall be eligible for the incentivization scheme. Provided that the minimum attendance maintained for eligibility by a teacher shall not be less than 50 % attendance till the date of service/ in one year. Provided further that the attendance shall be calculated according to records maintained as per the biometric system in the respective schools in the manner as may be prescribed. (5) The terms and manner of determining the benefits to be awarded under the incentivization scheme shall be prescribed under the Rules/ or notified from time to time by the appropriate authorities. iv. Moral turpitude in relation to conduct within or outside the domain of employment. Explanation: For the purpose of this Section the benefits, including pecuniary or non-pecuniary to be given under the Scheme, shall be in addition to the salary and other perks given under the regular employment contract of the teacher. AP Teachers Transfers Points Calculation Draft - Teacher Administration Act 2018. Teachers Transfers Performance Points Draft in Andhra Pradesh as per Transfers Act-2018.